Fluid grid layout has been available to use to construct mobile friendly, responsive websites since late 2012. It is preferred by Google, as the layout for the web page will respond to the screen size as it reduces or enlarges. How can I tell if my website is responsive (mobile friendly)? 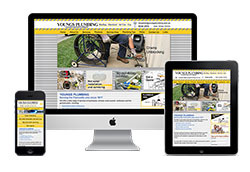 To check if your website is responsive, bring it up in a web browser screen. Then grab the side of the browser screen and bring it in so that it is as narrow as a tablet. If content starts to disappear on the side, the website is not mobile friendly. Another way to check is to bring your website up on your phone. If you get a tiny version of the site that looks exactly the way it does on your PC, the site is not mobile friendly. If you want your website to be adapted to a mobile friendly layout please contact us and we can give you a quote. Early in 2015 Google announced that it will be checking whether websites are mobile friendly. If they are not that will affect their ranking in search results. You can read the full announcement here. Here at Rangs Graphics we use Dreamweaver Creative Cloud to create a fluid grid layout. This allows us to create individual designs for each client, with three different layouts for PC, tablet and phone. The design and coding process for websites has been increased, but it gives our clients a better result for the SEO and accessibility of their websites.